Last week I made that strawberry pretzel salad and some Salad Olivier (subject of a future post). Today it was Clean Out The Fridge Soup, using up vegetables and chicken broth, and I gave making homemade noodles a second try. The verdict? 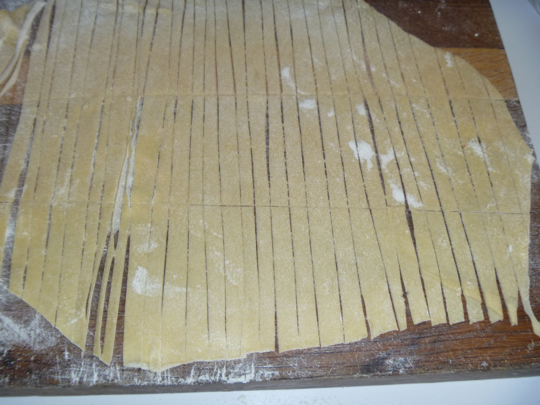 Thin rolling = better noodles. What kind of chicken lays half eggs? Taking the soup made with the noodles and random contents of fridge, slopping some on top of crackers and putting them in your mouth is also a good dinner. Popcorn -- lots of it. I should send Tony over for noodle making. The only noodles I’ve ever eaten that are better than his are his mother’s. Fantastic. I think the secret to his (and his mom’s) is the crazy amounts of flour used in the rolling out process. Plus, the extra flour thickens the soup a little. Perfection. So apparently the big secret to making good soup is to cook the onion until it is not just transparent, but invisible. Then you do the soup the regular way, and at the end, add something acidic. I thought ‘whatever’, until I ate some soup that had been made this way. No, they won’t let me own one. “Bad for the company image” or some such nonsense. My sister has an iPhone. I’m a bad typist.